First Impression is where I quickly review an album as I listen to it for the first time, so lets crack on with Gotthard's new album 'Firebirth' but first let me set the scene. With the loss of their distinctive and somewhat awesome lead singer Steve Lee in a tragic accident, people questioned what was going to happen to Gotthard a long running band still in their prime. They decided to continue with the new singer Nic Maeder and released 'Remember it's Me' a song that was very well received, their latest single off the album 'Starlight' seemed to me to received with mixed response, particularly in the metal community, so what will their latest album be like? A new sound? Can Nic live up to Steve a so renowned singer? The album opens with Starlight, a song heavily criticized by the metal community, perhaps due to Gotthard's current label being the stereotypically heavily Nuclear Blast. The song has a Nickle back feel to it, which personally is no bad thing for me. Its not metal but its a good light hearted song that rather catchy, I like it myself! Then we hit 'Give Me Real' its instantly recognizable as a Gotthard but a more classic Gotthard sound opposed to the later Steve Lee albums. Its not a stand out song but its very satisfactory, its the kind of song that you would feel very contented with if it came up on shuffle but you probably wouldn't pick it. 'Remember its me' a simply brilliant and moving song. One of the stand out songs of last year when it was released. Enough said a great song. Now we hit a heavier song, 'Fight', again there is no mistaking it's Gotthard. Fight is a pretty good song, easily over a 6/10 but not above a 9/10 'Fight' lacks a special something, a kick to make it a great song but its not disappointing at all. Really grows on you. 'Yippie Aye Yay', Yea yea yippie aye yay! Up beat, rocky and thoroughly enjoyable! 'Lift u Up' kind of feel to it. Strange robotic sound effect in the back ground gives it an interesting feel. All round a strong song. 'Tell me' is a ballad, not a power ballad, just a ballad but a bloody good ballad. This song could easily have been messed up but its well executed. I really like this one, its also not too long! 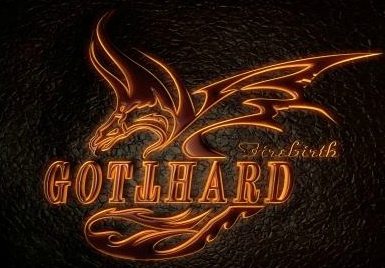 Well done to Gotthard. We now leave the ballad behind to 'Shine'.. and shine indeed a great song, a great Gotthard song. That rock sound with a dabble of heavy, catchy reconcilable. Good. 'The Story's Over' well its not at track 8/13 but regardless of that the 'The Story's Over' is hard to fault. Its probably the heaviest song on the album, its once again a good metal song. Nick's voice lacks the punch that a strong metal singer could bring to this but its doesn't feel lacking. 'Right on', Right, I'm writing this as I listen and I retract my previous statement, 'Right On' is a lot heavier than 'The Story's Over'. 'Right On' is a Metal song, its nailed superbly, Nic's vocals are prefect here. Perhaps to appeased some of the doubters they should have released this song. Very good. 'S.O.S' is not a plea for help its the album maintaining the stand it seems to be picking up, 'S.O.S' remains heavy. Again a very Gotthard sounding song, 'S.O.S' is great! Strong drumming, good guitar solo in the middle, , Nick once again does a good job. 'Take it all back' is less heavily that the previous few, returning to a more ballad theme, again its not a knock out song but its a good song. I can't really say more. 'I Can' remains fairly heavy, it shakes off the ballad song of 'Take it all back', its a much faster song. I really want to love this song and perhaps 'I can' in time. Its a strong song, catchy if not very simplistic chorus of you guessed it 'I can, I can.. I can'. 'Where are you' another Gotthard ballad, this time a standard gotthard rock ballad. This kind of song is what they would have recorded with Steve and he would have nailed it but equally so does Nic, there's a lot of similarity in their voices on songs like this. It quiet slow but thats not bad, very likeable. So thats it, all reviewed. First thoughts, this is a good album! Like a phoenix Gotthard have had their 'Firebrith' this is still very much Gotthard but it reminds me of their earlier works. Nic lacks the punch that Steve had and watching live videos he can struggle with some of the classics, particularly the heavy ones, but his voice has advantages and he doesn't feel at all out of place or lacking on the album. I think I'd call this a Rock album not a Metal album but Gotthard have always boarded Metal and Hard Rock, if your a Gotthard fan I find no reason why you won't love this album. To the causal or fan of their later works you might not so much. Firebirth is a good album, its not expectational but its hard to fault, I like it a lot. Upon finishing it all I recon 7.5/10 is fair, perhaps 7 but certainly not bad! They don't feel lacking without Steve, rest his soul, I certainly think they deserve to carry on! I look forward to more, although perhaps they should let Nic sing his songs live rather than force out sub standard classic? Or is that too harsh. Please comment away!